Tracing activities are great for building hand strength and developing fine motor skills, two crucial things for good handwriting. 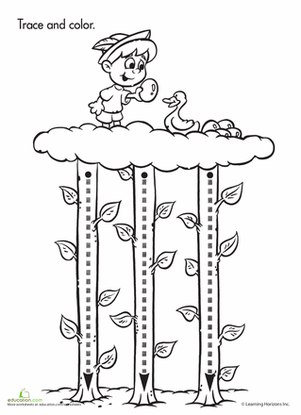 Kids practise writing straight lines in this cute coloring page featuring Jack from Jack and the Beanstalk. 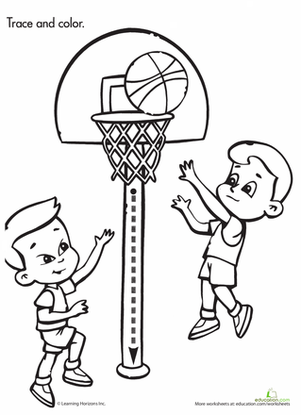 Sneak some writing practise into coloring time with this fun trace and colour printable. As she traces the lines, she'll build strong hand muscles for writing! Help your preschooler practise his fine motor skills with a sunny sky full of chances to trace curvy and straight lines. Shake up coloring time with a trace and colour activity that's great for strengthening little hand muscles. It's been a long day on the farm! Trace a line to help guide each animal back home. Trace the race car, then colour it in and watch it zoom off the page! 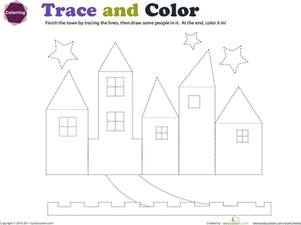 Get your preschooler ready for writing with this trace and colour worksheet. Tracing lines is the first step to building good writing skills. How many horizontal lines do you see in this picture? And when he's done he's got a great coloring page! Help your child build fine motor skills by tracing the circle shapes in the picture.